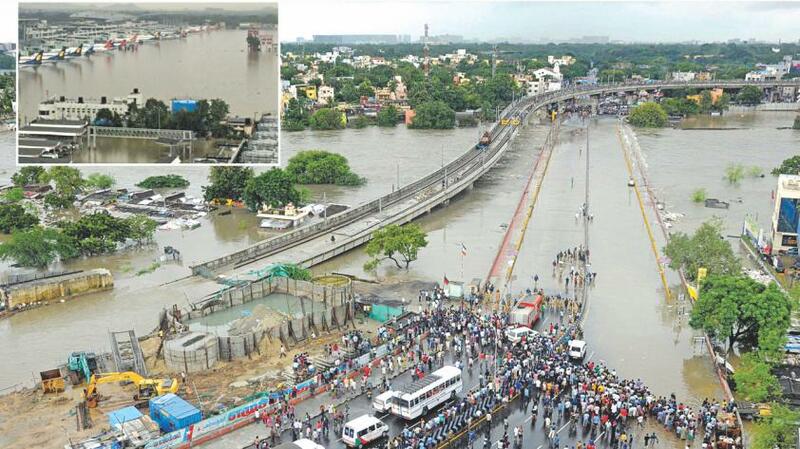 I read an interesting article on the BBC website today about the extensive flooding in Chennai, India. Tamil Nadu has seen huge amounts of rain recently, in the wettest December for 100 years and large parts of the city, including the airport are underwater. I’ve been paying particular attention to this event as I worked for a number of years with companies in Chennai and have many friends there. The article I mentioned fits in with a strange phenomenon I’ve written about before on the blog; the rush to apportion blame for flooding, something I don’t believe happens to the same degree for other natural disasters. Essentially the article is blaming poorly planned development and a lack of awareness of nature for the flooding, which seems to be a common refrain when discussing adverse flood impacts. What struck me while reading the article was the disconnect between the natural event and the effects of that natural event, which got me thinking about what we even mean (popularly) when we talk about “a flood”. I think it can be useful to break a flood down into the two components: the event and the effects. Thinking about the event itself, the EU flood directive defines a flood as “a covering by water of land not normally covered by water”. In almost all definitions of a flood there is no mention of impacts, so philosophically a flood could occur even if no-one was there to see it or feel its effects! A flood is not contingent on human impacts, but is a natural event. By and large, water covering an area of normally dry land is going to have its source in (abnormal) rainfall. Although there is some evidence human activities can have an impact on rainfall patterns, we can normally take the source rainfall as a fixed variable, i.e. there is next to nothing that can be done by humans to manage rainfall rates. When thinking about the raw volume of water within a catchment basin the principle losses from the system are going to be evapotranspiration, and typically these losses will be low during a rainfall event. So what we are left with is an essentially invariable quantity of water (in terms of human impact) delivered to, and within, a catchment for a given storm. In terms of human impact on whether a flood occurs we are therefore left with our ability to affect timings of delivery of the rainfall into rivers and down the channel network to areas which may or may not be flooded. Our ability to influence the speed of water transfer is largely driven by land use. As most people will be aware, impermeable concreate areas transfer water quickly and efficiently into channels, forested areas tend to do so more slowly (with a spectrum of land use in between). It is possible; in short duration events (as shown in some of my work), to manipulate the speed of water transfer in different parts of a catchment and so affect flood magnitude and duration. However, there is a really important concept in hydrology related to this issue, which is “time to equilibrium”; this is the time taken for a drop of rain falling at the most distant part of the catchment to reach a downstream area we are interested in. IF a rainfall event persists for a length of time approaching the time to equilibrium (e.g. a long duration rainfall event), and if the rainfall rate is sufficient to lead to flooding, then any land use effects of slowing or speeding transfer of water will be irrelevant in terms of whether a flood will occur. Flooding may be quicker, deeper, longer or shorter, depending on human management, but it will occur in that rainfall event. This is important because from a hydrological point of view floods occurring from long duration weather events such as the ones in Chennai or in Somerset a few years ago are inevitable. It is never correct (hydrologically) to say that human impacts caused the floods. A disconnect between people and the environment such that at-risk groups are ill prepared for flooding and thus the impacts of flooding upon them are more severe. A lack of planning on the part of emergency services and governments such that evacuation and mitigation plans are poorly thought out, ineffective or completely absent. These are the areas which are ripe for critical analysis by government bodies; principally how can they make sure they minimise the number of people and quantity of vital infrastructure that is exposed to flood risk. How can they make sure that individuals and organisations are aware of the risk they are living with and know what to do when a disaster occurs? In the case of Chennai tackling planning laws and the application of them to prevent building in high risk areas and increasing awareness of risk would be really important steps to minimising future flood impacts. I’ve written about this before in Indian flooding, where (in a different hydrological context) the narrative was very similar, focused unhelpfully on stopping floods, rather than mitigating their impacts. Clearly, indiscriminate development and shoddy urban planning have directly led to, or at least exacerbated the impacts and damage from floods in India’s fourth most populous city. It can actually be damaging to the aim of minimising flood impacts to suggest that floods such as the one in Chennai would be avoidable with better planning, as this can actually hamper raising awareness of living with risk. It’s important we focus on what we can change and do better in order to properly prepare cities around the world for a likely future increasing in flooding through climate change. I was excited this week to have a paper accepted in the journal Ecohydrology, not least as I think the findings could prove to be really useful for river restoration and river management. In this post I want to try and break down the implications of the research for river management/restoration practise. At a later date I’ll break down some of the science implications in another post. At its simplest the paper is trying to link together the geometric form and architecture of a logjam and the changes in local erosion and deposition associated with it. 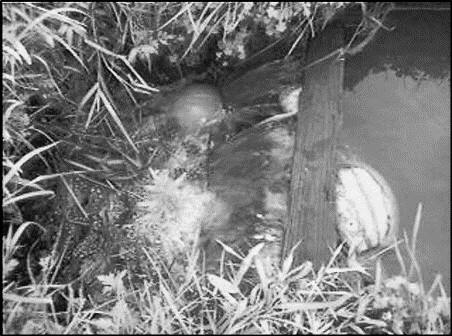 There is a wealth of information in the academic literature on the effects of logjams at promoting particular features/habitats, such as a greater number of logjams in a river being related to a greater number of pools. Many river managers and river restoration professionals will probably know how to install a “tree kicker” to promote the scouring of fine sediment and creation of exposed gravels, by using an angled piece of wood to concentrate ambient flow and promote local scour. However, perhaps surprisingly, there isn’t much in the literature (academic or professional) linking what a logjam looks like and what it does in terms of geomorphology. This makes it very hard for professionals to design engineered logjams to accomplish a particular management objective. One of the key objectives I had was to try and understand if there was a link between, for example, bigger logjams and a higher likelihood of a pool forming, or logjams against one bank and scour. Without going into too much detail about the method the main principle is to collect measurements of the logjam itself and the geomorphological change to the channel around it, along with measurements of the channel dimensions. All the measurements are then converted to ratios, for example by dividing logjam width by channel width, making it much easier to compare between sites. I end up with 7 variables, and do a cluster analysis on these so that all the logjams in my river “clump together” statistically into groups. This reveals the biggest groups, or types of logjam in a river and also what the architecture and geomorphological effects of these logjam groups are. We can display these logjam clusters as radar plots (fans of console games will notice this is similar to how sports games display player stats! ), which allows us to compare visually the different types. 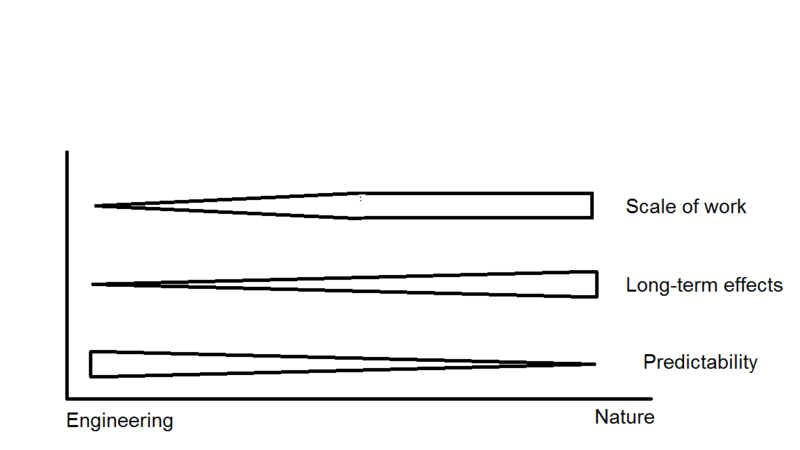 One of the key findings of the paper is the link between the relative sizes of the logjam (compared to channel cross section) along with its porosity (the amount of void space in the structure) and the association with erosional or depositional features. A low porosity is key as it increases hydraulic resistance and backs up water behind the logjam (rather than allowing it to flow through the structure), this then either spills over the top, scours underneath or is diverted towards a bank. It’s this concentration of flow, with an associated increase in velocity, that leads to focused erosion and the creation of pools/bank erosion. I found that channel spanning logjams tend to be the ones which create pools, but this is strongly linked to porosity and to the size of the structure. Broadly speaking a logjam with very low porosity (so a tight structure packed with leaves and fine wood) produces a pool, and this pool is typically deeper for a larger structure. Large logjams with moderate porosity tend to produce some geomorphological effects, but these tend to be smaller magnitude and are somewhat tricky to predict (scour, lateral erosion, bar formation). The importance of porosity is also seen for smaller logjams, where I found two distinct types of logjams which partially fill the channel; those with loose structures which do very little geomorphologically, and those with moderate to low porosity which divert flow and cause moderate bed scour. So the overall message would be; if a manager can afford to be relaxed about exactly what geomorphological change is occurring within a given reach, then tight logjam structures with low porosity (both channel spanning and partial) appear to be the best way to increase general geomorphological hetrogenity (pools, berms, scour, lateral migration) and thus habitat provision. There are lots of caveats here, the most important being these are statistical results from just one river. If engineered logjams were designed based on these results in a similar river, and if there were a hundred of them, the overall patterns should hold true. However it is very hard to predict the effects of a single logjam based on its structure (yet). The plan is to conduct more research in other rivers using this method (and hopefully other researchers will also adopt it and we can combine our results), this will allow us to really firm up some guidance for building engineered logjams to achieve specific goals. The paper will be put into my University’s archive as open access soon and I’ll update this post with a link once that happens. At some point this week I anticipate we’ll pass 50,000 views for the River Management Blog, which was beyond our wildest hopes when we started it off a little over two years ago. To celebrate this milestone I am going to give away a very special gift/prize to one lucky fan of the blog. 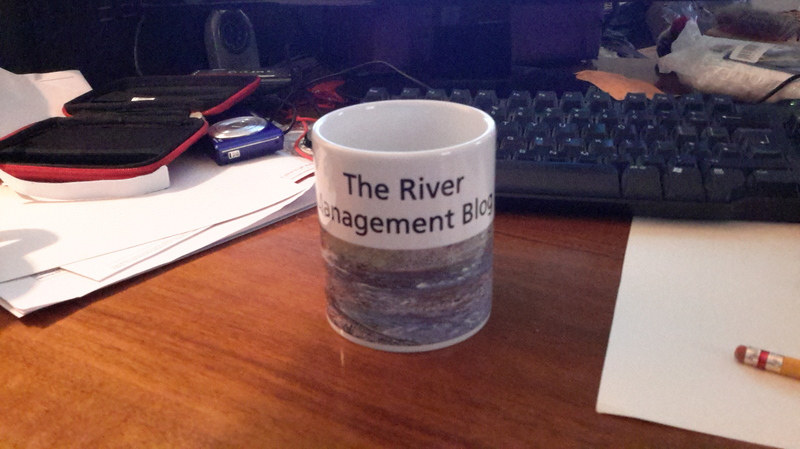 A River Management Blog branded mug! If you want to you can do both and I’ll enter you twice! I came across an interesting research angle this week looking at how people who live in and interact with river landscapes value different parts of the environment. I read a paper from 2002 in the journal “Landscape & Urban Planning” by Sampei Yamashita. Dr Yamashita gave a camera each to a group of adults and children who lived near a river in Japan and asked them to take photos of the environment and describe what they saw. The idea behind this was to match up their language and what the scene was showing in order to assess what they liked, what they valued and what they found interesting. Photo from the study by a child “We often catch fish at a spot like this. Dozens of fish come upstream here, so we can catch a lot” Copyright © 2002 Elsevier Science B.V. All rights reserved. The findings of this research are very interesting, particularly in the different ways adults and children perceive the environment. Adults who took pictures of the river had a fairly even split between photographing the entire river (32.8%), the opposite bank (26.1%) and a detailed shot of the water surface (29.0%). In contrast children were much more interested in the water itself with 53.8% of their river photos of just the water surface. It should be noted this is controlled for the height differences between the groups (i.e. perspective), in fact children got closer to the water (horizontally) to take pictures than the adults. The children are more interested in the water itself, rather than the aesthetic quality of the landscape. 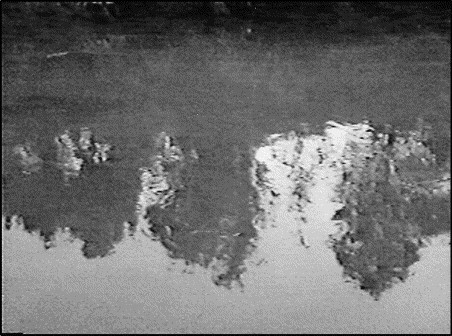 Another photo from the study by a child “This part of the river [water] is clearer than others ” Copyright © 2002 Elsevier Science B.V. All rights reserved. In terms of how the participants rated the features in their pictures, adults were more interested in flow rate and surface conditions of the river, they evaluate the landscape in response primarily to the features of the water. In contrast the children (in keeping with their closer focus on the water itself) were more interested in the water quality (using phrased like “clean” and “pure”), evaluating the landscape without reference to specific water features. Photo by an adult ““A lot of sand and stones have been carried in. At Yoshidamachi Bridge”” Copyright © 2002 Elsevier Science B.V. All rights reserved. The finding of this study also echo another earlier piece of work in which people were asked to assess pictures of a “wild and scenic” river in Colorado (I believe akin to the UK’s “area of outstanding natural beauty”) at different flow stages. This study found there was an optimum flow stage at which participants rated the scenic beauty of the river landscape highest; roughly at the mid-point between low flow and the highest flood. This ties into the above finding about adult’s preference for flow rate in valuing landscape. There has to be enough flow in the river to make it wild and pretty, but not too much so it begins to look threatening. The importance of this in terms of river management is in relation to managing recreational riverscapes. Where adults are the dominant viewers of the landscape, planning would need to incorporate mid to long-distance elements and dynamic aspects of water. However where use of the landscape by children is important there would need to be more focus on short-distance water elements, paying attention to features such as visual water quality. From my own experience this would suggest children would enjoy messing about in some of the lowland chalk rivers we have in the UK with their characteristically clear waters. * What the research indicates quite vividly is that adults and children look for different things in rivers and so we need to be mindful of the needs of children in order to get them engaged in valuing and appreciating the landscape around them. * – this obviously in no way constitutes an instruction or avocation for letting or encouraging children (or adults) of any age to play in or near water without wearing full protective gear, a comprehensive safety assessment and the details for Falmouth Coastguard on speed-dial. – Play safe. Yamashita, S. (2002). 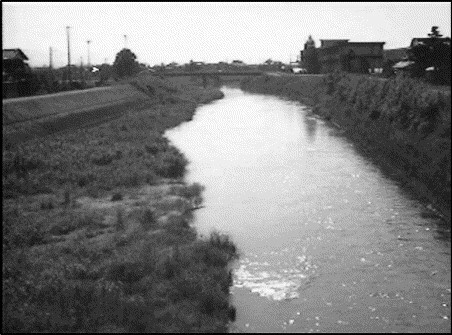 “Perception and evaluation of water in landscape: use of Photo-Projective Method to compare child and adult residents’ perceptions of a Japanese river environment.” Landscape and Urban Planning 62(1): 3-17. Brown, T. C. and T. C. Daniel (1991). “Landscape Aesthetics of Riparian Environments: Relationship of Flow Quantity to Scenic Quality Along a Wild and Scenic River.” Water Resources Research 27(8): 1787-1795. 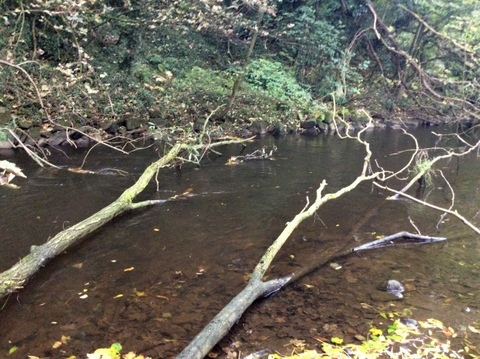 The presence of in-stream wood in rivers is a fairly complex and chaotic management issue. It’s not neat and tidy and to a degree wood in a channel is unpredictable, both in its effects and its behaviour. 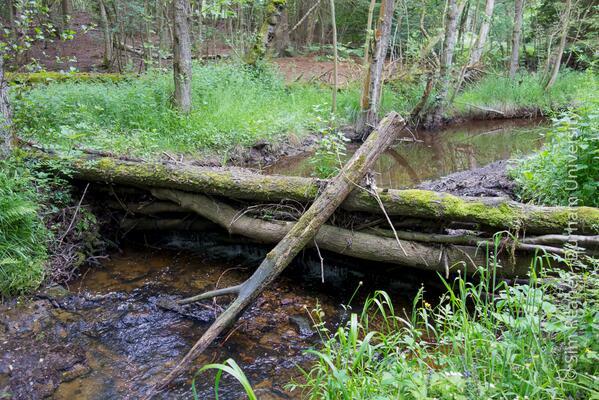 Wood moves around in the channel, slows the flow of water and can drive local bank erosion. It can also restrict human activities in the river, blocking passage for canoes and boats and making it physically more difficult to for fishing. However, we know from the scientific literature and numerous management examples from around the world that wood can have enormous and varied benefits to stream ecosystem functioning and diversity. In addition to benefiting the ecosystem there are many linked benefits in varying patterns of erosion and deposition which alter channel geomorphology, as well as wood potentially being part of an integrated flood risk management programme. It’s a natural human impulse to want to control and stamp our mark on the landscape, so potentially unpredictable elements of the landscape, such as wood in rivers, can create problems and frictions. In the past we wanted neat, tidy river systems, not wild, untamed riverscapes. And there is plenty of evidence that society still resists and is afraid of natural rivers. More recently river managers have tried to reintroduce in-stream wood as part of river restoration projects and the concept of “rewilding” landscapes is beginning to get more attention. 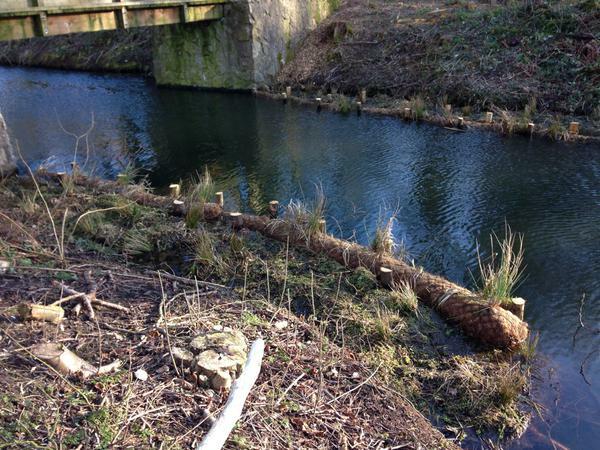 In the long-term, such projects need riparian woodland to be restored in order to provide a sustainable input of new wood to the channel as the old pieces rot away. However, in the UK the scope for planting woodland or “rewilding” is restricted by develop and issues of site suitability. In that context we can’t plant woodlands everywhere and so a lot of in-stream wood projects can only ever be short-term. So how do river managers square this circle of competing and contradictory demands? How can we ensure a project using wood has desired benefits but isn’t ‘messy’ or unpredictable? And how can a project achieve long term goals without riparian woodland to supply new wood? Part of the answer is that in-stream wood management is not a simple ‘one-size fits all’ solution, there are a myriad of ways of using wood to achieve specific goals which will have different effects (see sketch opposite). If we are talking semantics, many (most?) of these projects are not really ‘restoration’, but provided limitations are known in advance they can be viable management options. 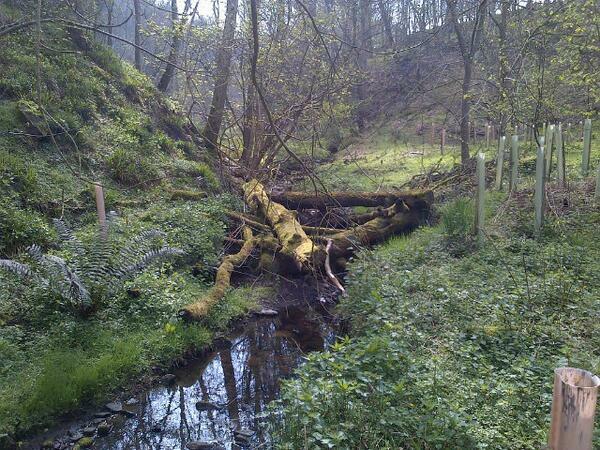 A key concern with natural in-stream wood is its mobility, something I covered in a recent post and journal article. Managers want wood to stay in the same place both to harness its effects in a desired location, but also to stop it moving off and causing problems elsewhere. The example to the right is of a logjam in Pickering, part of the “slowing the flow at Pickering” project. This structure is likely to prove effective and relatively long-lasting, but it is not really representative of a natural structure. Fundamentally this is engineering with natural materials, harnessing what we know about in-stream wood to successfully deliver a very specific effect in a particular location. However, it is only going to deliver this effect for the length of time the wood takes to rot, so would need ongoing monitoring and management. Anchoring a structure in place is one way of overcoming the unpredictable nature of wood. Such an approach requires a fairly detailed geomorphological and hydrological assessment, as the local hydraulics will change to accommodate the structure. By being fixed in place the effects on erosion may be intensified, for example if a fixed logjam persists in a location for a very long time it may generate a substantial scour pool. Likewise a staked or cabled piece of bank reinforcement may focus flow towards the centre of the channel and cause bed scour and channel deepening. Such unwanted effects can be particularly problematic where wood is being used as an erosion control measure (see post on erosion control). The issue here being that the wood is doing nothing to address the imbalance in stream power which is driving the erosion. In a crude sense the river has ‘too much’ energy and is expending it on eroding its bed/banks. Reinforcing in one place (whether with wood or concrete) even if successful, often pushes the problem up or downstream. 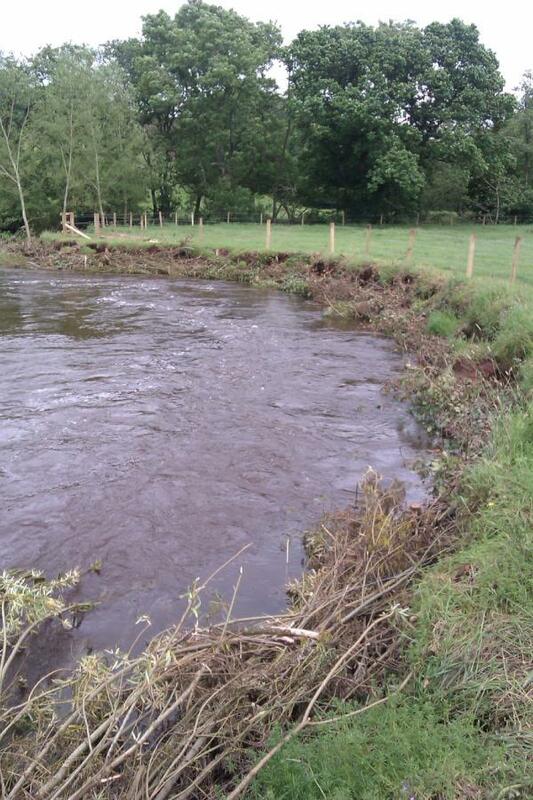 A popular method of creating areas of slower flow and/or arresting erosion is to use brush or willow spilling. 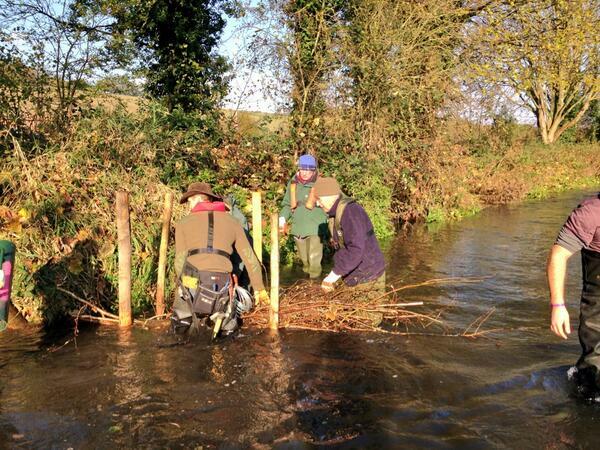 This can be a very effective technique in the right place, particularly where the willow can subsequently become established as riparian trees, sprouting out of the cut wood. So do these distinctions between engineering and “restoration” really matter? I would argue they do insofar as it is important for people managing (and often volunteering) on projects to understand the goals, the mechanisms, the outcomes and the likely time-scales the project is working over. Where a project is a true “restoration” to a new quasi-stable state (in reality extremely rare), once the project is completed (and if successful) the river should not require any further substantial management. However, where a project is fundamentally engineering based it follows that the project will either need continuous monitoring and upkeep, or the project is intended as a one-off site specific intervention designed to last for a given time before the structure fails. Either way there needs to be an acceptance the project is a long-term commitment to continuing low-level management of the channel using natural resources (potentially indefinitely). This then raises the issue that goals and likely success of a given piece of work need to be understood and communicated, in order that the stakeholders can absorb any potential individual project failures without losing commitment to the overall management scheme. It is in light of this that I think “restoration” can be an unhelpful and misleading term when applied to all management using wood. Potentially raising false expectations in stakeholders and volunteers of the outcomes and workload/commitment in improving a river using in-stream wood management. There is no doubt that using wood as a method of enhancing the river environment is a useful and effective management tool. Debates around what terms we use for various measures can seem a bit academic. However, when so many projects to improve stream health are dependent on the goodwill and efforts of stakeholders and volunteers it is vital project goals are understood and clearly communicated and part of this is using clear language. I’m always excited to hear about new projects using wood for river management so please let me know in the comments or on twitter if you are involved in one. Continuing our mini-series on career profiles within the water management sector, this post covers the job of university researcher. For this I have the unenviable task of interviewing myself. I turned up late, wore sunglasses throughout, even though it was cloudy and was evasive and uncooperative in questioning. Thankfully the great production team managed to edit the interview very well. So, silliness aside this is a profile of the job of Early Career Researcher in academia. Simon Dixon is a NERC Post Doctoral Research Fellow in the University of Birmingham Water Sciences Group within the School of Geography, Earth and Environmental Science. Most of the work I do day to day is computer based in an office. My current research project involves a lot of remote sensing work (processing and analysing satellite data) so I tend to work with GIS programs fairly extensively, as well as using/writing computer code. Apart from the actual work, the key currency in universities is publishing papers in academic journals so a fair bit of time is taken up with writing up and revising papers. Depending on what area of research you are currently working on the actual day to day work can vary enormously. People working on ecological or water quality/chemistry areas may spend a significant portion of time in a lab processing and analysing water samples. In my research group there are seven post-docs and currently there are four who are mainly desk based, one mainly lab based, one heavily focused on field work sampling and a couple of people who mix field/lab and desk work. One of the main attractions of a career in research is investigating new things and making new discoveries. Most of the time these aren’t big exciting breakthroughs though, more like small incremental advances in how we understand aspects of river functions. There are variations between research groups but typically researchers are given a certain amount of autonomy to pursue different research avenues with a project (or outside of it) so you do have a degree of freedom in what you are researching even early in your career. How much time do you spend working with rivers in the field? My current job involves very little direct time in the field, over a 24 month contract I will expect to spend around 4 weeks actually on/near a river, which averages out to about 1 day every three weeks. Other research jobs would have significantly more field time, but this would still typically average out no more than 1 day a week. Again it will depend on the role, but usually a researcher won’t be doing anything TO a river, but will be using various bits of equipment to collect data on the river as part of some form of survey. What qualifications do you need to get into an entry level job in this/your profession? It will depend on whether research is conducted in a university or for a commercial organisation, but usually you will need a PhD. There are research assistant posts which require an MSc, but it would be hard to do a more junior research role for a long period of time. Typically people may move into a research assistant role and if they want to stay in research use this as a stepping stone to starting a PhD either full or part-time. Depending on the institution you may also need a masters degree in order to get entry onto a PhD in the first place. However, many universities will take on people with a 1st in a relevant BSc, and will accept a 2:1 alongside relevant work experience and an application that shows an aptitude for research. Research Council PhD’s are much more restrictive than privately funded ones, as they have strict guidelines on funding eligibility. If you have a 2:2 or 3rd in your first degree it is not impossible by any means to get into research, but you will almost certainly need a masters degree, relevant work experience in some aspect of the water industry and to look for a non research council PhD. To work as a research assistant or a laboratory technician typically a masters degree would be required, however these positions can often be very competitive and many of these jobs are filled by people holding, or working towards a PhD. What other things are useful/essential to get into the profession (work experience, professional membership)? Researchers are also expected to generate their own research money through grants, so any evidence of aptitude in this field is very helpful. Later on in their career researchers would do more teaching, but experience in this area would not really become important in successfully getting a job until this point. In terms of getting a first (or subsequent) research position bankable skills can be very important, and in some cases could make up for a lack of paper publishing. High level abilities in programming/coding, GIS/remote sensing, taxonomic identification in ecology research and experience with specific advanced field techniques can all be very useful skills. These tend to be more uncommon and so someone with those skills already saves the employer training them up. What skills and knowledge would a researcher pick up in the first few years on the job? Specific skills are very hard to quantify given the vast range of water science related projects. In my current job I have gained a lot of new GIS based skills around processing satellite data, as well as improved my coding skills for data processing. In general a researcher would improve their technical writing skills, and ability to convey complex information concisely. Most projects involve large amounts of data so often a researcher would become well versed in managing, cataloguing and querying large datasets and databases. Linked to this, statistics are important in many fields, particularly hydrology related ones, so they would gain or improve maths skills. GIS is also becoming increasingly important so most water science researchers would have at least a basic knowledge of programs like ArcGIS, if not fairly advanced skills. What would be a typical career progression for someone in this area? Difficult! A typical career path would involve working as a post-doctoral researcher for at least 2-5 years before working as a lecturer. All post-doctoral work is on short, fixed-term contracts (12-36 months), so typically a researcher would need to relocate 2 or 3 times (to another part of the country or overseas) before getting a lecturer job. There is then a progression through grades of lecturer up to professor; although only a small number of lecturers would eventually expect to achieve a professor position. The number of positions in various levels of academia decreases very sharply from PhD to post-doctoral researcher and then again to lecturer, this means for any post-doctoral or lecturer position the competition is fierce. Many people who start off on a career as a researcher are not fortunate enough to gain a permanent position. If the time taken to complete a PhD is factored in as the ‘entry level job’ a prospective researcher in today’s climate faces 8-10 years of job instability, possibly multiple house moves, and I would estimate a no better than 20% chance of landing a permanent job at the end of it! So it is important to go into the career path with realistic expectations. Universities are increasingly looking to improve the professional development and skills training for people working as researchers on fixed-term contracts, in order to increase the attractiveness of researchers to non-academic employers. This helps researchers market themselves to other parts of the water management sector. Researchers often gain unusual, highly technical and sought after skill sets and so it can be seen as a coherent path to another job in industry, rather than necessarily just a career in its own right. Keep an eye on the blog for further additions to this series. If you are a professional in the water industry and would like to take part in this series, particularly if we haven’t covered your career yet, please get in touch with Simon via twitter or email.